A photo display honoring the late Dan Driscoll has been installed in the Town Hall lobby. 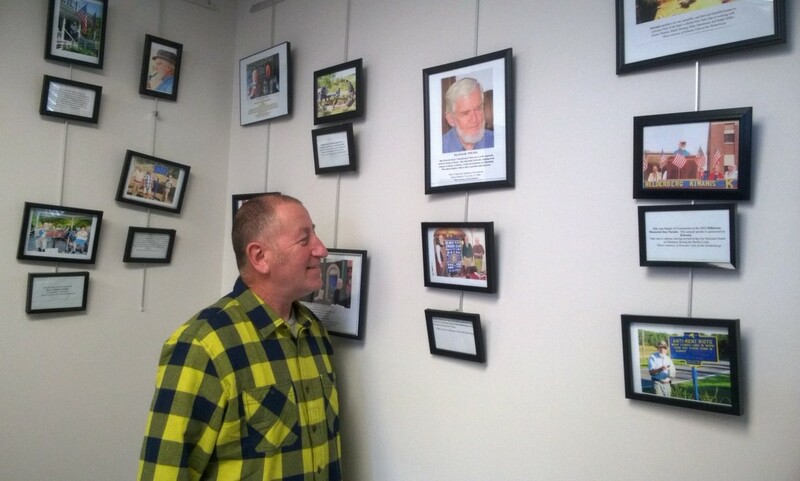 Here, KHS President Dennis Barber views the photos which highlight the diverse interests of Dan. A resident of Knox for over 40 years, Dan shared his expertise in music, science, gardening, and history with many community groups, ranging from the Kiwanis Club of the Helderbergs, Knox Traditional Strings, Delmar Community Orchestra, Hudson Mohawk Land Conservancy,and the Knox Historical Society. The photos will be displayed for several months.